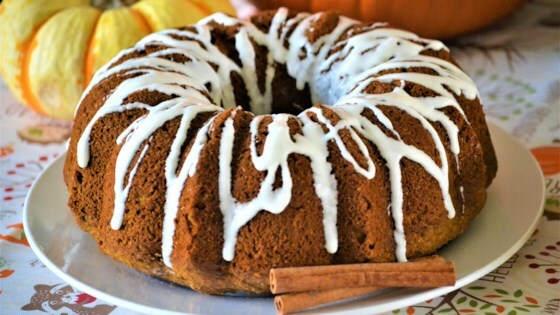 "Even though pumpkin is a fall favorite, this spice cake recipe using canned pumpkin puree is good any time of the year." Preheat oven to 350 degrees F (175 degrees C). Grease one 10-inch bundt or tube pan. Bake in preheated oven until a toothpick inserted in the middle comes out clean, about 1 hour. Let cake cool in pan for 5 minutes, then turn out onto a plate and sprinkle with confectioners' sugar. This delicious, moist pumpkin spice cake is baked in a sheet pan. Way too much oil for this recipe. I would use only half the oil. Easy to prepare, moist, and tasty. Not too spicy either. You can cut the cooking time in half if you use a 13x9 rectangular baking dish.